Ending up hundreds of miles from home after a spectacular wrong turn may upset even the hardiest of seafarers. But yesterday an adult leatherback turtle (Dermochelys coriacia), discovered at the weekend in the Firth of Forth, was given a clean bill of health by marine experts from the CRRU. The huge creature, weighing more than half a tonne, sparked fears for its health when spotted languishing 20 miles up the river near Alloa in Clackmannanshire on Saturday. A search of the area ensued to try and locate the turtle using 3 boats working together to cover a 30 mile stretch of the Firth from Stirling to theForth Road bridge, but to no avail. 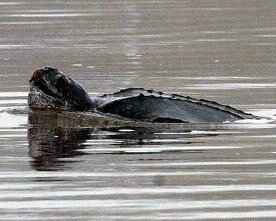 It was initially thought that the giant turtle might have found its way back to the open sea, but on Tuesday night Central Scotland policemen spotted the reptile near Kincardine power station in Fife. Subsequently an elite team of Medics from the CRRU, BDMLR and the Borders Underwater search Team (BUWST) was scrambled, and by early evening the team was able to inspect the animal for injuries. Led by Dr. Kevin Robinson, Director of the CRRU and Scottish Co-ordinator for BDMLR, the team of medics and divers were able to make an informed assessment of the condition of the 1.5 metre turtle in the water. Dr Robinson said: "He was a very obliging turtle. He seemed as interested in us as we were in him, which was a very encouraging sign! It was a very exciting experience." "In consultation with veterinary experts, we were able to assess the strength of the turtle as it swam next to the boat, closely observing its behaviour and looking for any signs of physical trauma. We reached the conclusion that he was fit and well, and decided that attempting to catch him at this stage would probably do more harm than good". Dr Robinson said marine specialists would remain on standby should the turtle get into any trouble. Weighing up to 1.5 tonnes in weight, leatherback turtles are the largest turtles in the World and sole living representative of the family Dermochelyidae. They are the only endothermic (warm blooded) turtle of all the turtle species, allowing them to make extensive migrations from their warm water breeding sites in the Caribbean to colder water feeding grounds in the Arctic. In the UK, sightings of the species occur mainly during the summer and autumn months, and are almost certainly the result of this deliberate migratory journey as the turtles follow swarms of their favourite prey item, the jelly fish. People in the UK imagine turtles live elsewhere, but in fact leatherbacks are clearly a part of the fauna of the Celtic Sea, and we may even have an important summer concentration just off the edge of our continental shelf. Records indicate that leatherback's have been sighted in the Firth of Forth before. Several leatherback turtle sightings have also been made recently in the Moray Firth. In September 2000 an adult leatherback, measuring in excess of 2 metres, was seen 3 miles north of Hopeman, and on 5 October 2000 another leatherback was recorded 2 miles north of Whitehills, Banff, chomping on a Lion's Mane Jellyfish. The CRRU & BDMLR would like to thank the medics and divers who made the operation possible, the guys from BUWST, the SSPCA (especially Brian Cowing & Doreen), Emma Keebles and James Barnett (for exemplary veterinary advice), International Animal Rescue, the Port Edgar Port Authority (thanks for the supply of the rigid inflatables and donated fuel costs guys! ), the skipper and crew of "Martha's Boy", the Military of Defence Police and the staff at Deep Sea World Aquarium.